Srinivasu Chakravarthula, CPWA (CPACC + WAS) > My writings > Vasu Dairy > Experience in Goa! Last week, we did a quick holiday at Goa. Though we wanted to be there just for 3 days, accidentally planned for 5 days. (Chosen wrong date while booking tickets). We have landed in Goa on 27th September morning and hired a taxi to reach Angels Resort and driver told us that this resort is far from beaches and many tourist spots; so he offered us to show us a few hotels near the beach. However, he has showed us at least 5 hotels and all of them looks fancy at the reception but rooms are awful. One of them has rooms in 5th floor with no lift. So we have decided to stay at the Angels Resort itself and that was a great decision. Angels Resort is worth for money, as they have promised in their website, rooms are spacious, joyful swimming pool, room with table tennis and carom board. They also have a gym. Staff are pretty Curtis and food was delicious. They do have free shuttle to a couple of beaches and city shopping. We have first visited Calangute Beach; this is quite beautiful and where you find a lot of people. This place is surrounded by market places for visitors to purchase beachwear and other needs. It does have good waves of sea and perhaps one of the most visited beaches. Next we have visited Vagatore beach and this is something we have enjoyed the most (just that one needs to be careful while enjoying here). This beach has some wonderful waves and not that of too much dust. It has some good clay that one can play with. At the season times, this beach will also see a few rides being organised. We have spent here for a few times and thoroughly enjoyed. Next we have visited is Panjim city that has some beautiful architecture built by Portuguese a few hundred years ago. We have visited a restaurant, a temple and spice garden. Spice garden is one of such places where one can learn about how different spices that we use on daily life are grown. 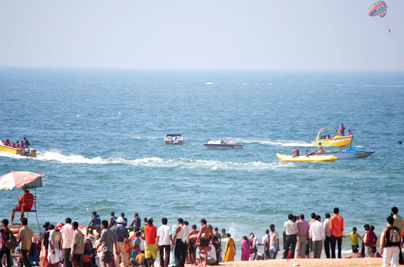 Then we have visited Bagha beach that has some wonderful rides and boating. Honestly, we found those ride providers doesn’t give you experience for the worth of what they charge you. They say boat ride would be for 30 minutes but it would be less than 20 minutes in reality. They asks you if you would like to see a dolphin but never show you. Those providers needs to understand that tourists will come to experience something good and open to spend money. Finally we bought some sweets, cashews and chocolates. Overall the stay in Goa was good but local transport is a bit expensive. Another thing is that most of the drivers think about comfort of their parking than interest of touring guests. This attitude needs to be changed.